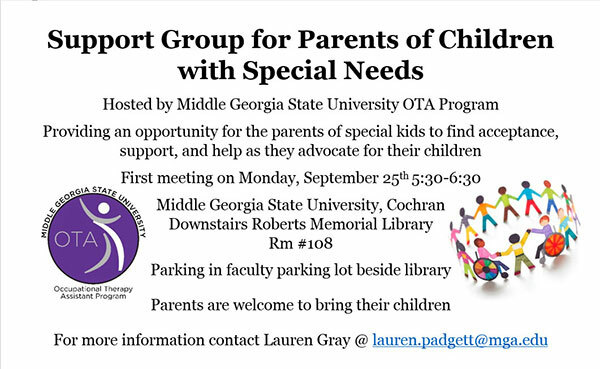 Faculty and students of Middle Georgia State University's Occupational Therapy Assistant degree program are organizing a support group for parents of special-needs children in the Cochran area. The first meeting is scheduled for 5:30 to 6:30 p.m. Monday, Sept. 25, in room 108 of Roberts Memorial Library on Middle Georgia State's Cochran Campus. The library is at the corner of Ann and Second streets. Parents of children with physical, mental, and emotional special needs are invited. "Through our work we realized there are many parents who need this kind of organized support but it wasn't available in the Cochran area," said Lauren Padgett Gray, lecturer in the OTA program. "We wanted to see if we could help meet a need those parents have as they advocate for their children." Parents who have questions prior to the meeting can call Gray at (478) 934-3114 or email her at lauren.padgett@mga.edu. Campus maps and directions are at www.mga.edu/about/maps.php.